At the age of 15, a very active and (by his own admission) stubborn Will Murley was diagnosed with scoliosis - a curving of the spine which can cause an uneven posture and other health complications including reduced lung capacity. This year Will ran every day for 30 days, before setting off on a huge 30 mile run on the final day – his 30th birthday. In 2005, at the age of 15 I was diagnosed with scoliosis – a curving of the spine which can cause an uneven posture and other health complications. Not only had the scoliosis affected the curvature of my spine, but it had also reduced my lung capacity. These were things I would have to learn to live with. I had always been an active young lad who liked getting out and enjoying the countryside, walking hills, running and cycling. After a nine hour operation and two weeks in hospital I was sent home with a full cast from neck to waist. I was stuck inside waiting to get back outside to everything I had enjoyed doing. During my time in hospital I was told that taking part in any sport would be difficult and that cycling would definitely be out the question, due to the need to lean forwards. Being someone who would not give up or take no for answer (some might say stubborn), within days of my cast coming off I was out on my bike. I’d never go very far and always go very slow, but I was out and already proving people wrong. After a nine hour operation and two weeks in hospital I was sent home with a full cast from neck to waist. I was stuck inside waiting to get back outside to everything I had enjoyed doing. Within a year I had completed the Ten Tors Challenge, walking 45 miles over Dartmoor in two days carrying a heavy backpack. I completed my first marathon a year later. I achieved these goals not in any world record time, but I had completed them. Enjoying all things physical, in 2008 I applied to join the Royal Marines. After a long battle with the MOD medical team, and despite having the full support of my surgeons, the MOD still felt recruiting me was too much of a risk to take. This completely knocked me. I didn’t know what to do with my life and struggled for many years to find a purpose apart from keep doing the things I loved doing - walking, running and cycling! In the back of my mind I had always wanted to hide the fact that I was different. Having poor lung function would mean I would breathe heavier than others and the slight curve in my spine that remained meant I had sloping shoulders. I had gotten used to living with the fact that whenever I took my T-shirt off I would have some impressive scars and not the “normal” body image. Being someone who would not give up or take no for answer (some might say stubborn), within days of my cast coming off I would be out on my bike. As the years went on I pushed myself harder and harder, getting many more marathons under my belt and lots of miles in the saddle. I also qualified as a mountain leader and started a family. 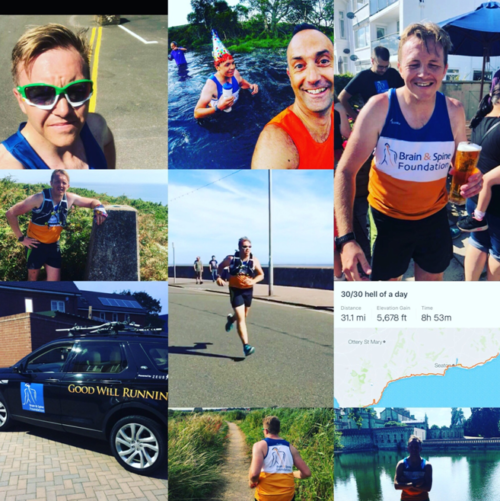 One day whilst out running in May 2018, I thought to myself that my 30th birthday was coming up in a few months and that I should set myself another challenge. At the time I didn’t realise quite what an emotional effect it would have on me in the months to come. I decided that I should also try and raise some money for a charity so I chose the Brain & Spine Foundation. The charity was close to my heart, not because it had ever supported me, but because it supported people like me: ordinary people who need help with neurological problems. But what challenge? I wanted something that was again close to my heart, that would push me, and that maybe the average Joe couldn’t do (that way the average Joe might give some money towards my challenge!). I also wanted something with the number 30 in it as I was to be 30 years old. 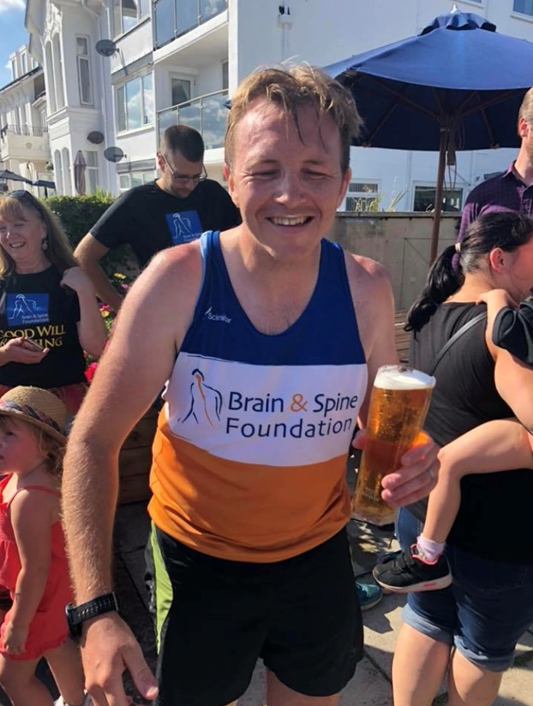 The Brain & Spine Foundation was close to my heart, not because it had ever supported me, but because it supported people like me: ordinary people who need help with neurological problems. The response to ’30 For 30’ that I received on social was unreal - people wanted to know about my condition, they wanted to donate and they wanted to support! 30 days in 30+ degree heat! The challenge started in early July when I was working away in London. 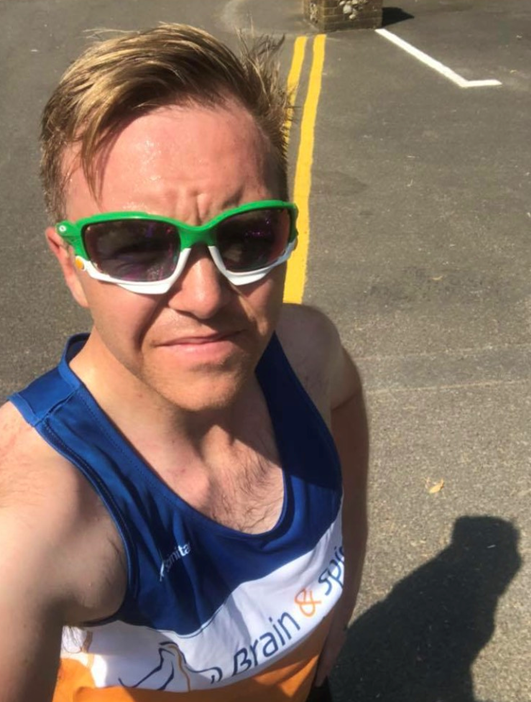 Four miles a day didn’t seem too bad but, with the hottest weather the UK had seen since the 60s, I ended up doing my first four miles in 30 degree heat. WOW - I have never been so hot. Being more of a cold weather person, I started to wish I had said I would run three kilometres a day! Not being one to give in easily, before I knew it the first week was done. I was still feeling pretty fresh but the weather hadn’t cooled and the sun looked set to remain. The second and third weeks were tough. My body started to hurt and I was drinking so much water to replace the lost fluids that I felt like I had a water bottle tied to my hand! To make things easier for me, a few mates offered to run with me during these days. 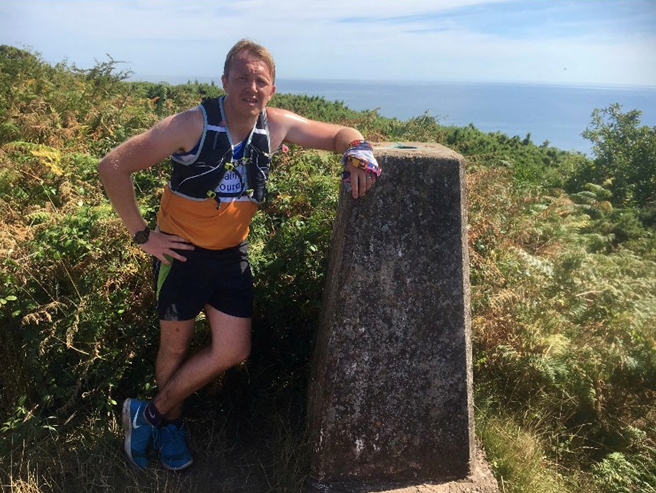 Having someone to chat with was great and they even offered to run legs of the South West Coast Path with me, but I wanted to do it solo - this was a challenge I needed to crack on my own. My wife, as supportive as ever, started to show a real interest in my challenge. I got wind that she was planning stuff in the background but she told me to just keep running. The night before the final day I was donated a running vest by a friend’s company - this vest had water bottles attached to the front so I didn’t need to stop to get water out of my bag. With the route mapped and my wife briefed on the pit stops, lay-bys and car parks along the coast-path, I was ready for the off. My alarm was set for 5am, my bag was ready by the door. I would get up, drive an hour to the starting point and then begin my run, hoping to finish by 5pm so I could have dinner in the pub with my family at the end. At 4.58am there’s a car beeping outside my house. I open the front door and a good friend of mine Baz is stood there, camera in hand, wearing a T-shirt saying ‘Good Will Running’. 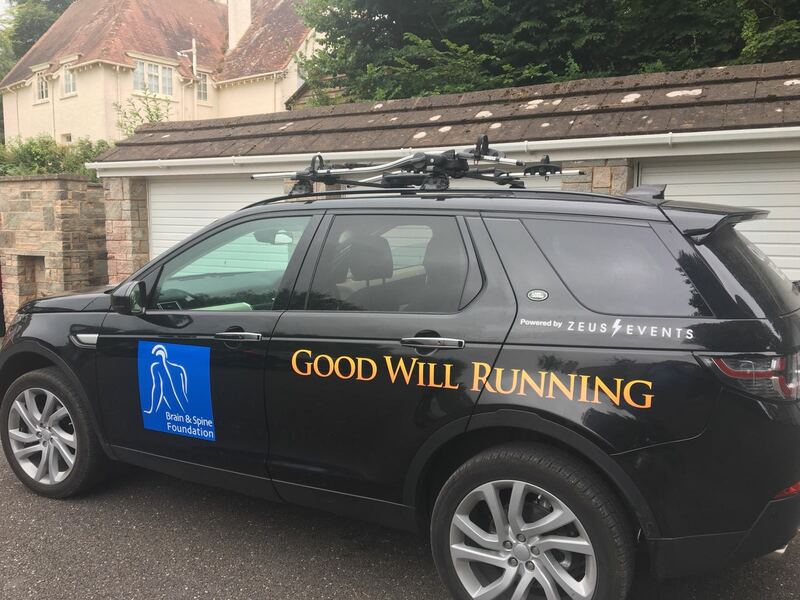 His car also has a sign saying ‘Good Will Running’ on the side, as well as the Brain & Spine Foundation logo! He tells me he’s my support crew for the day and that he and my wife will be with me every step of the way. I was buzzing - no one had ever done anything like this for me before so I left the house with a spring in my step. I was buzzing - no one had ever done anything like this for me before so I left the house with a spring in my step. The first seven miles were tough. Setting off at 6am from Lyme Regis to beat the sun had worked but the 29 previous four milers were starting to catch up with me. The South West Coast Path is beautiful but so so so hilly. I had walked parts of it in the past but the sun was out and I realised that this run was going to be brutal. As I went through my pit stops I was doing OK. The hills kept coming and I kept battling over them. Towards the 17 mile mark, I started to drink faster than I could fill up my bottles and I soon ran out of water. I was able to get water from random walkers on the path and I managed to make it to the 20 mile pit stop. “Ten to go,” I remember my wife saying as I sat in a heap on the boot of the car trying to eat something. It would be six miles until the next check point and I knew there were some big hills heading my way. With the midday sun now on me I knew I would have to dig deep and keep pushing. As I ran out of the pit stop my wife shouted that there was a surprise for me at the next one. I spent the next six miles thinking about would it could be. Was it cake? A pasty? As I passed the marathon mark and dropped down the hill into the next pit stop I could see more than just my wife and Baz stood by the support car...my surprise was two of my closest friends, Steve and Dan! They said they knew I didn’t want any one running with me in support but that they were coming anyway – they are both good runners and I was glad of it! There was just one huge hill to go, through the caravan path then down on to Exmouth seafront, and down onto flat for the last mile and a half. The last hill went on for what felt like years and, after some classic jokes with Steve and Dan, I was on the sea front. As I ran out of the pit stop my wife shouted that there was a surprise for me at the next one. I spent the next six miles thinking about would it could be. Was it cake? A pasty? At one and a half miles to go and I was joining a route I have done so many times - the end was in sight. Everyone jumped into the support car and I watched it shoot off. I was all alone again, which felt strange. I pressed on. 500m to go and I saw the support car parked by the clock tower. As I ran passed it Baz shouted from the window, “Run in the road, we’ll stay right behind you!” I felt like an athlete and I felt fresh again. As I hit the final bend I saw the road was full of people waiting for me outside the pub. What I didn’t know is that my wife had been planning a surprise birthday party for me at the finish-line all along! As I crossed the line I felt a huge sense of achievement but also a huge sense of relief. I could finally have a day off and no more running for a few days! I completed 5600ft of ascent and covered 31.5 miles on the final day, making a total of 148 miles for the month. The event raised almost £600 for the Brain & Spine Foundation, smashing my expectations. The challenge had made me push myself physically and let me come out of my shell about my condition. I would like to thank all those who supported me throughout the ‘30 For 30’ challenge, especially my wife and family. I am now looking forward to my next challenge in October when I’m taking part in the 50th Original Mountain Marathon, a two day race across the mountains in South Wales! Whatever your limitations, don’t let them stop you from doing what you want to do. Whatever your situation, never give up.